A Dutch oven is a heavy cooking pot with a tightly fitting lid that is good for braising. Dutch ovens are also excellent for making soups and stews. Its weight and heft mean you probably won't use a Dutch oven every day, but it's a great tool for slow cooking. If you're interested in buying a Dutch oven, there are a few factors to consider. A Dutch oven can be used either on the stovetop or in the oven, and they're usually made of cast iron. Cast iron Dutch ovens need to be seasoned before using, like other cast iron cookware. Because they can withstand extremely high heat, cast iron Dutch ovens can also be used for deep-frying. The Spruce Eats / Melissa Ling. Cast iron cookware has a reputation for being difficult to clean (although it's actually quite easy to clean). It's not just the cleaning, however, but the overall maintenance. If not cared for properly, cast iron pans can rust and become unusable. 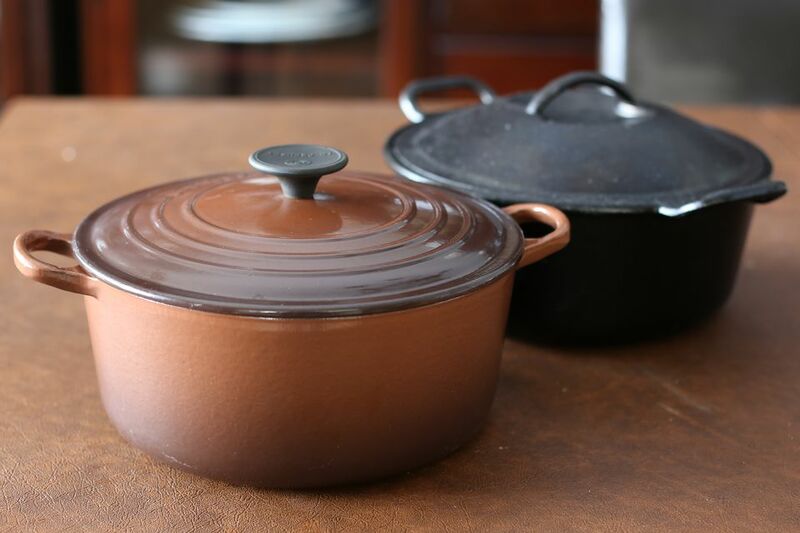 Some Dutch ovens have an enamel coating over the cast iron, which makes them easier to clean than plain cast iron, and there's no worry about rust. On the other hand, the enamel can crack or chip. And since the enamel on the inside is usually white, once it becomes discolored, it can be nearly impossible to return it to its pristine white condition. However, this doesn't affect the ability to cook and isn't unsafe in any way. Note that cast iron is a poor conductor of heat, so it takes a long time to get hot, but it retains that heat for a long time. That's what makes Dutch ovens ideal for braising meat. Once the liquid reaches a gentle simmer, it requires very little energy to maintain that temperature. That means you can keep the oven at a relatively moderate temperature (or even turn it off, especially toward the end of cooking time), and the food inside will keep right on cooking. Moreover, having a heavy lid means you don't lose liquid to evaporation, and the steam generated inside the pot remains in there, continuing to bathe your pot roast in the sort of gentle moist heat it needs in order to turn out tender and succulent. Of course, Dutch ovens are heavy beasts — especially when they're full. That can make it tricky to get it in and out of the oven, because (depending on the height of your oven), you might have to lean quite far forward to reach it. Combine that with the fact that it'll be extremely hot when you take it out of the oven, you have a potential safety issue if you have any trouble with your upper body or back. On the other hand, they are virtually indestructible. There are even Dutch ovens that are designed for camping, with legs to raise them above the embers of your campfire, and a steel handle that works well for hanging it above a fire. What Essential Equipment Do You Need for Making Great Soup?